St. Martin's Press, 9780312377694, 150pp. 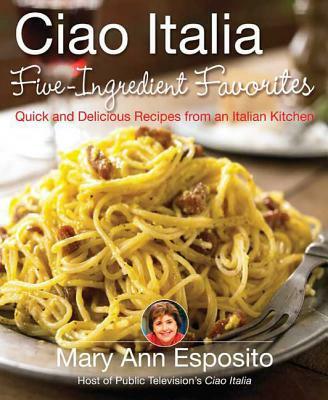 With "Ciao Italia Five-Ingredient Favorites," Mary Ann Esposito serves up a surefire way to please family and friends with easy recipes that are quick and delicious. MARY ANN ESPOSITO is the host of the long-running PBS series "Ciao Italia." She is the author of nine successful cookbooks, including Ciao Italia Slow and Easy and Ciao Italia Pronto!. She lives in Durham, New Hampshire. Praise for two other Mary Ann Esposito classics that show home cooks how to prepare authentic and delicious Italian meals with ease!